We’re in the midst of change. Evidence is everywhere, in big ways and small. Some of this change is terribly exciting and some is terrifying. At this New Moon in Sagittarius, I find myself needing a strategy to ride these waves of change. I am trying to maintain equilibrium even as I react to every up and down in my life. As 2011 winds down and we prepare for the new year, it feels really important that we orient ourselves to our guiding values, so even as the ground shifts, we know who we are and what is really important to us. Sagittarius is the Archer. The stars of this constellation depict a centaur pulling back on his bow, getting ready to let loose an arrow that actually points toward the very center of our galaxy. Long-range vision and core truths belong to this sign. We need both as we navigate change. The questions I hold now are, what is the world I long to see manifested through these changes, and what are the values that guide me as I make choices throughout these changes. This New Moon presents a challenge. It is a Solar Eclipse, which intensifies emotional charge and brings additional uncertainty. In addition, Mercury is stationing retrograde the day before the eclipse. 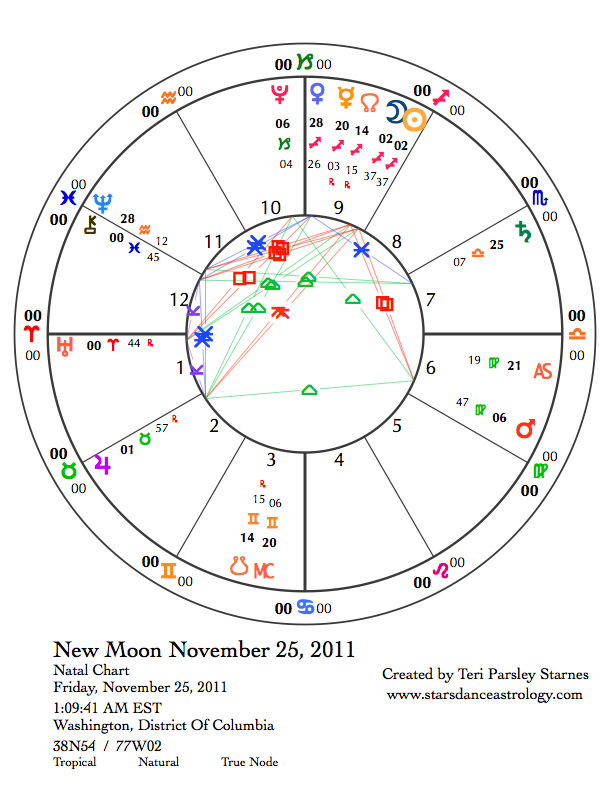 Mars and Chiron also square the New Moon, adding a quality of heightened empathy and reactivity. 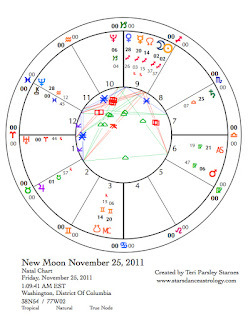 In other words, this is an excellent lunar cycle to practice awareness that fosters our visions and our guiding values. What are yours? “Human freedom involves our capacity to pause between the stimulus and response and, in that pause, to choose the one response toward which we wish to throw our weight.” Rollo May – The Courage to Create. Life is full of things that provoke us. Sometimes, a fierce and sudden reaction serves our intention. However, I’ve noticed that I make more mistakes by reacting quickly than when I stop to pause between whatever stimulates me and what I choose to ultimately do about it. Rollo May, in the quote above suggests that not only can we avoid more mistakes by pausing before we choose, but that freedom itself lies in the ability to pause first before choosing. I’ve been thinking a lot recently about this idea of freedom. Often we are tied to our reactivity, playing out old stories and wounds that have nothing to do with the actual situation before us. Imagine the freedom we could have, if we stopped to look at our own impulsivity—pausing before choosing. Mars is the planet of impulse. Last month, I wrote about the Mars retrograde journey. Mars has begun the first portion of that journey, still traveling direct through Virgo. Mars is contributing to the tension we may be feeling at the New Moon, and I believe, is also a guide to examining what we can do about it. Virgo is the sign of order, practice, and service. It isn’t a particularly comfortable sign for Mars to spend an extended period of time in. The planet of impulsivity must wear the clothes of humility and must channel his aggression into creating order. If Mars is energy, then we can direct that energy into daily practice—small acts that bring integration. This integration can help us achieve the freedom to pause between stimulus and response. Pausing, integration, freedom—that sounds lovely doesn’t it? It won’t be easy with Mercury retrograding. 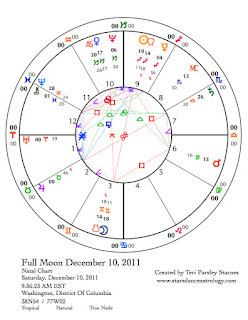 On December 13, Mercury stations direct just one degree away from the Solar Eclipse degree of 2° Sagittarius. It is as if the trickster god has a special mission this month to see how well we can hold to our core truths and visions. And maybe we shouldn’t hold too hard. Flexibility is so important during this time. If freedom comes from pausing, then genius comes from being flexible in our truths. Perhaps we need both qualities to meet these changing times. The Full Moon this month is a Lunar Eclipse. Uranus, the ultimate instigator of change and awakening, is stationing direct at 0° Aries the same day. Mars is also squaring the Sun and Moon. 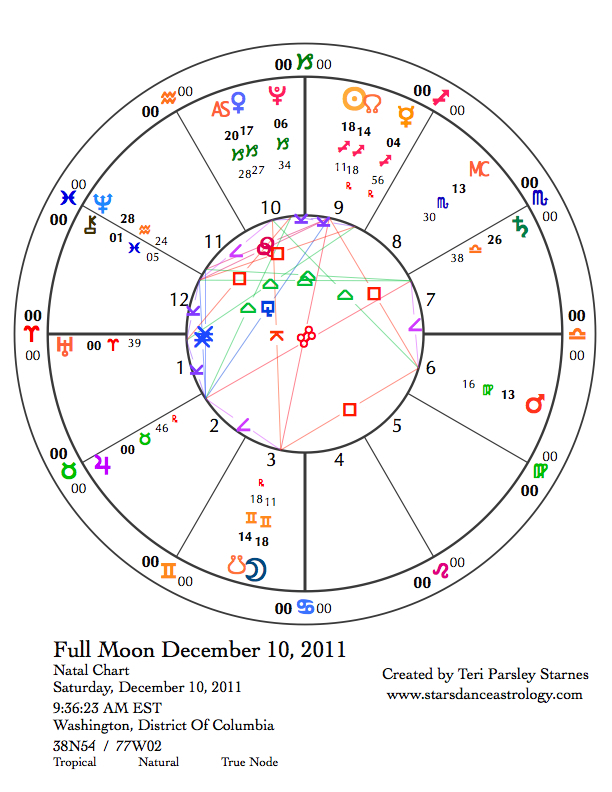 This Full Moon does not promise to be any calmer than the period leading up to the New Moon. However, the signs Gemini and Sagittarius invite illumination. Our understanding of the world, of other people, of our own truth may expand in unexpected ways at this time. Sagittarius is an understanding of the macro and Gemini is an understanding of the micro. When these come together, we achieve a deeper understanding of the whole. Another important turning point this month is the Sun’s entry into Capricorn, which marks the beginning of Winter in the Northern Hemisphere. At this time, the Sun at 0° Capricorn exactly squares Uranus at 0° Aries and this signals another season of uncertainty in world events. In the U.S., since these planets are angular, there may be significant change–especially in the areas of real estate, homeland security, and relationship with allies. Change is present. However, we still have the ability to choose our response to change. Every time I am able to exercise my ability to choose my response, I develop a sense of freedom. The Archer of Sagittarius, riding toward the next horizon—the next adventure of discovery—is an image of the freedom that is possible for us all.